If you walk up to a barn, you might say, "Something stinks in there." If you talk to today’s teenagers, you might hear, "Hey dude, what smells?" In Shakespeare’s time, "Something is rotten in Denmark." Hamlet Act 1, scene 4, 87–91: The character Marcellus, and not Hamlet, is the one who coined the phrase. There's a reason he said the "State of Denmark" rather than just Denmark: the fish are rotting from the head down—all is not well at the top of the political hierarchy. In 2012, you might say, "Something is rotten in the U.S. Congress." At this time, Americans give Congress a nine percent approval rating. That nine percent need to have their own minds checked. Barack Obama enjoys 46 percent approval after three years of failed policies, 46 million Americans subsisting on food stamps and another 15 million unemployed. That’s for starters. For three years, top investigators have pursued Barack Obama’s legitimacy for being president of the United States. His mother was a U.S. citizen, but his father was from Kenya. That’s in question because Obama bears zero resemblance to his purported father. Jerome Corsi wrote a book: Where’s the Birth Certificate? His evidence shows compelling facts that Barack Obama is not a U.S. citizen. Lawyer Orly Taitz pursued the question all the way to a federal court in Georgia last week. Georgia State Administrative Judge Malihi ordered Obama to appear. Obama failed to attend. A retired Denver, Colorado ICE agent, John Sampson, testified that Barack Obama cannot pass an E-Verify employment check because of a fraudulent social security number made out to a man in Connecticut who died before Obama was born. Nonetheless, no American citizen is given any other person’s social security number and no American citizen is given a social security number other than the state from which he or she resides at the time of the issuance. Barack Obama’s social security numbers starts with "042" showing that he obtained it in Connecticut. However, Barack Obama has never lived in or has he worked in or in any way been connected to the State of Connecticut. His grandmother, however, worked for the Social Security office and the speculation remains that she stole a dead man’s number from Connecticut and gave it to Obama. Thus, compounding the fraudulent identity of Obama. While Judge Malihi last week found Obama not guilty of fraud as to his birth certificate and allowed him to remain on the ballot for the next presidential election in Georgia, the quest of Obama’s fraudulent Social Security number looms large. "As the U.S. Constitution allowed for every citizen to pursue success, happiness and fortune, to the best of each one's ability and desire, because of the promise that the rule of law, as opposed to the rule of man, would protect their rights and their property, so too did it draw to this country, the best the world had to offer," said Dwight Kehoe of Little Silver, New Jersey. "This is what America is and America is the U.S. Constitution. Clearly the Constitution has been under attack from the left and from the right for many years now. This past week, as Judge Malihi's obviously political ruling settled over this nation like a dark onerous cloud, one could not help but think the enemies of our democratic republic are winning in their struggle to destroy the freedoms we have for so long enjoyed." Additionally, because Obama did not answer his subpoena to appear before court, how could he win the decision? That’s like Ali and Frasier fighting for the heavy weight title, but Ali didn’t show up, but later was pronounced the winner and Frasier the loser. Someone must have gotten to Judge Malihi with money, threats or other persuasions. You cannot find someone innocent when they didn’t show up for the trial. Obama didn’t show up and his lawyers abdicated. Ironically, Obama has reportedly spent $2 million to seal all his records and maintain a full time law firm to keep his records under strict secrecy. 1. Why did the Judge make a ruling on "credibility" of the witnesses without either cross examination or appointing an expert to review the charges and testimony? 2. Why did the Judge reach out to a lower court ruling, where clearly the few people involved in that case had no clue about Article II, and ignore case after case from our own United States Supreme Court? Could it be because he was operating on an agenda as opposed to the law? 3. If the Judge was going to allow the defendant not attend or testify under oath and thereby made his ruling based upon the "defense" he provided for the defendant, why were the plaintiffs not given the opportunity to cross examine the Judge before he made his ruling? 4. Since Judge Malihi was performing as the defendant's advocate, should he not have been put under oath and questioned as to why he refused to have other experts verify that the birth certificate is a forgery and that Obama's SSN failed E-Verify instead of simply dismissing the testimony? To that I say, "Something really stinks in the Barack Obama presidency." Why? No matter how you cut it, obfuscate it, cover it, falsify it and evade it—Barack Obama, if he gave his social security number to a prospective employer for a check at E-Verify to determine if he is a U.S. citizen and eligible to work in this country—Barack Obama would fail. In other words, this country has been misled, duped, lied to, scammed and buffaloed. In this coming election, the American people must demand honesty, integrity and honor to the U.S. Constitution. That cannot occur with a president that possesses a falsified Social Security number, which leads any rational person to appreciate that one lie leads to another and that Barack Obama is a liar and he knows it. Lies can never be covered up and they will be exposed in the course of time in this free country governed by the rule of law and not of men. It’s only a matter of time before the truth comes out in a court of law. Frosty Wooldridge possesses a unique view of the world, cultures and families in that he has bicycled around the globe 100,000 miles, on six continents and six times across the United States in the past 30 years. 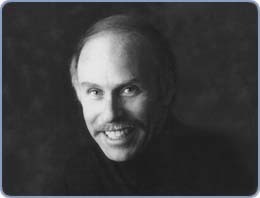 His published books include: "HANDBOOK FOR TOURING BICYCLISTS"; "STRIKE THREE! TAKE YOUR BASE"; "IMMIGRATION’S UNARMED INVASION: DEADLY CONSEQUENCES"; "MOTORCYCLE ADVENTURE TO ALASKA: INTO THE WIND—A TEEN NOVEL"; "BICYCLING AROUND THE WORLD: TIRE TRACKS FOR YOUR IMAGINATION"; "AN EXTREME ENCOUNTER: ANTARCTICA." His next book: "TILTING THE STATUE OF LIBERTY INTO A SWAMP." Shipping Damaged Goods..accident or company policy? I'm one of those individuals who does virtually everything across the Internet. It is in that spirit that I sought and found a set of replacement radiator cooling fan motors on Junkyard dog.for my dad's 1991 Nissan Sentra E (which I now own since his passing). The car has deep sentimental value and I have sought to maintain it as it was when he was alive. I decided to order. The item arrived from Sunrise Nissan delivered by United Parcel Service (UPS) on the evening of June 8th, some 15 days after it was ordered. 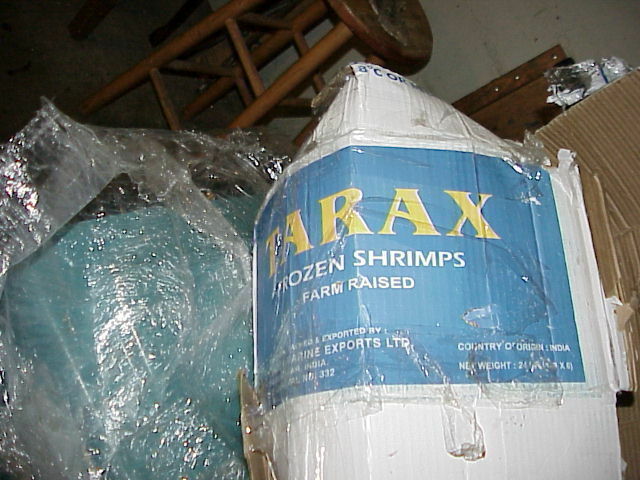 At this point, I'm not certain if this particular auto salvage operation also sells or prepares shrimp at their location but it might be wise to scan any shrimp you order from California with a metal detector before serving. The second fan shroud was extensively damaged. One of the broken frame sections was lying underneath the fan blade as you see top center. There is a fracture about 3/4" from the right hand side of the missing top piece penetrating through the entire shroud assembly. The lower frame was broken clear through at its bottom as shown in the photo top. It was not found in the shipping carton. 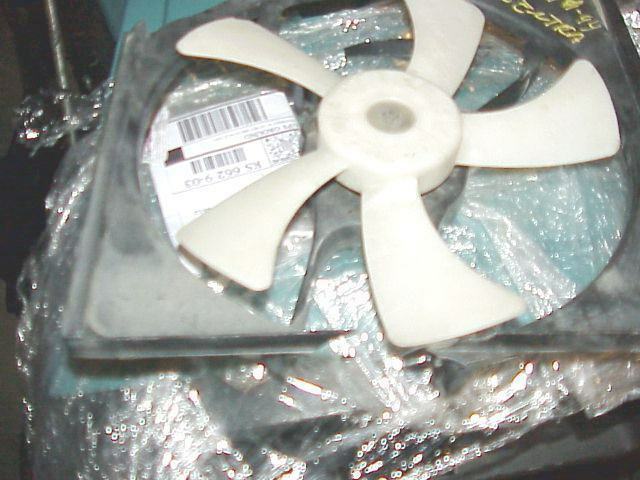 Either, the shipper or UPS, placed the broken shroud parts in the bottom of the shrimp carton along with the two fan assemblies. "Thank you for sending us the photos of the damaged package. We will now inspect the package and notify your shipper of the results. We will contact the shipper by the end of the next business day. If you are the receiver, please stay in contact with your shipper for additional information regarding the final disposition of the claim. 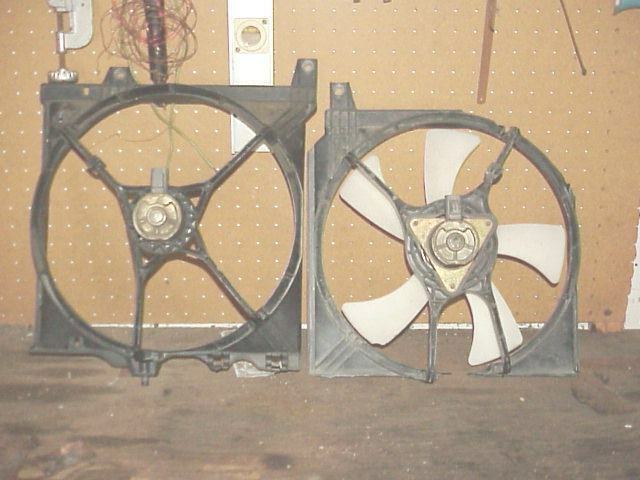 Photo: Original Fan Shroud assemblies..
Sunrise Nissan has not responded to date. Lacking the common courtesy to respond to its customers gives one an indication of what their 6-month fan warranty might be worth. Is it a wonder that California is going broke? So, whose fault is it for the damaged items? Both the Shipper and Carrier will blame each other for the damage; it's the consumer who loses. 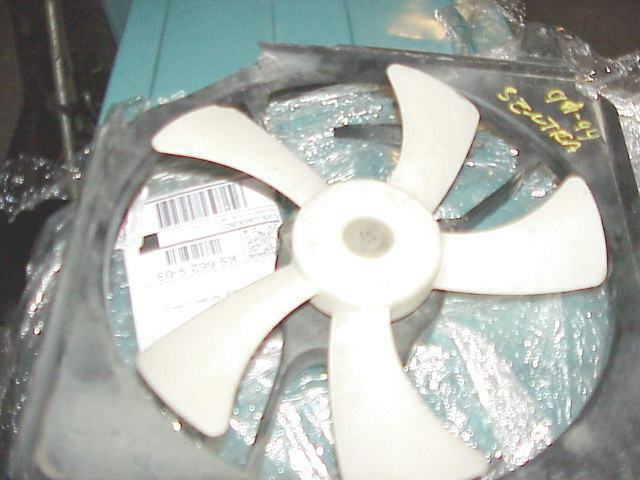 I was fortunate, neither fan motor was damaged, both work satisfactorily and replacing the shroud will cost about $52.08. But why not just use the original fan shroud assemblies already on the vehicle which were in good shape? Well, ordinarily that would have been a viable solution but in this case, the replacement fans mount differently in the shroud assemblies than the originals as shown below. Photo: The Nissan original and replacement fan shroud.. 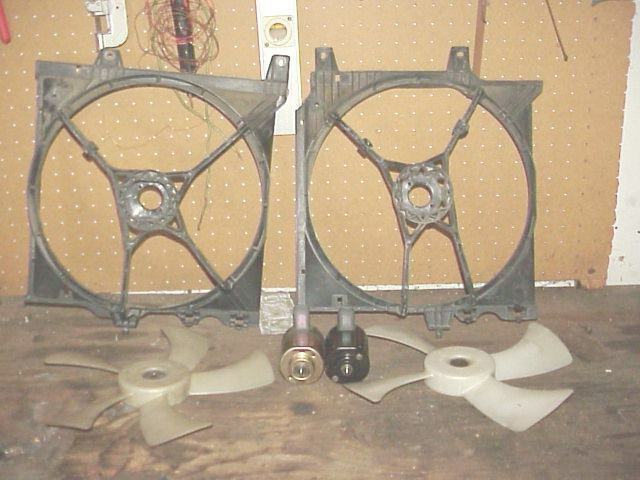 Although both are '91 fan shrouds, the replacements ordered from Sunrise Nissan utilize a triangular mount that's actually part of the motor and can't be removed. Swampers or auto dismantlers have no particular incentive to remove parts undamaged.. getting orders filled quickly is what counts. And, UPS already has quite a reputation for damaged goods and often refuses to pay claims on things it wrecks in transit. One claimant writes: "I shipped a wall sculpture at THE UPS STORE in Lagrange KY on February 25, 2009. The item was undamaged and in good condition when I took it to them for shipment to my home in Virginia. I paid 90.50 for shipping, handling and insurance on my sculpture. When it arrived in Virginia I found my 822.50 sculpture had been totally destroyed. " Another writes: "I shipped a desktop phone system to a customer by packing it in a heavy box, wrapping each phone 2x in large-cell bubble wrap, and adding Styrofoam peanuts for extra protection. The customer contacted me stating the phones arrived looking like they had been smashed by hammers.."
It's why consumer advocacy sites like "Angie's List and others have sprung up on the Internet. Angie's List serves some 750,000 consumers with ratings on who's good, who isn't and who's in the 'penalty box'. Suppliers do not pay to get on Angie's List, they must earn their way on in either in providing good or unsatisfactory service. Today's consumer not only faces the risk of receiving merchandise like this from unscrupulous sellers, but also has to deal with callous shippers like UPS who often damage otherwise satisfactory and serviceable goods in transit. Carriers make their money on the sheer volume of merchandise they ship; careful handling is NOT conducive to maximizing company profits. It's better to push the volume to the highest maintainable level and let the smashed articles accumulate as they may. After all, UPS faces no real retribution other than unpopular publicity and if you deny most of the damage claims, you're profit ahead. Shipping UPS should not be a first choice. It should only be done for items that are inexpensive and easily replaced or simply can't be broken. Remember, your money is never damaged in transit and seldom lost.